KEW ENGG. & MFG. PVT. 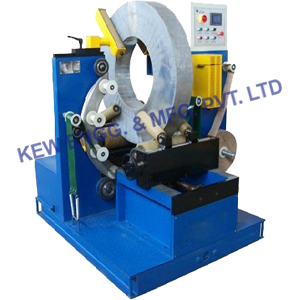 LTD. have been manufacturing, exporting and supplying Coil Wrapping Machine from India. Also, high quality machines, fully automatic machine, heavy duty Coil wrapping Machine also, the coil shaped products in a spiral style through eye of the product. Featuring with Modularized electrical control box, also, Smart & compact design- 8 units in a 20′ container. Our Coil Wrapping Machine mostly used in different industry for metal band, pipe bundle, vehicle tyro, wire coils and many more.